I mentioned a few times that cooking is not my main domain of expertise (and yes, this is an euphemism), but I've improved a lot, mostly thanks to food blogs. Still, probably because I'm not completely comfortable with a whisk in my hand, cooking takes me a lot of time- I'm way slower than almost everybody I know when it comes to cooking. When I found recipes that only involved 5 ingredients (or less) and actually looked good (and healthy for the most part) I thought I had struck gold. Most of these recipes are very simple, but sometimes less is more. Plus, I kind of lose all of my creativity when I open the door of the fridge, so even the simplest idea is probably something I'd never have thought of. 1. My favorite resource is Stonesoup. The blog is filled with easy, simple, quick and healthy recipes that you can whip up in minutes. If you're hungry for more, sign up for her newsletter (it's free) and you'll receive a free copy of her "5 ingredients recipes" e-cookbook. 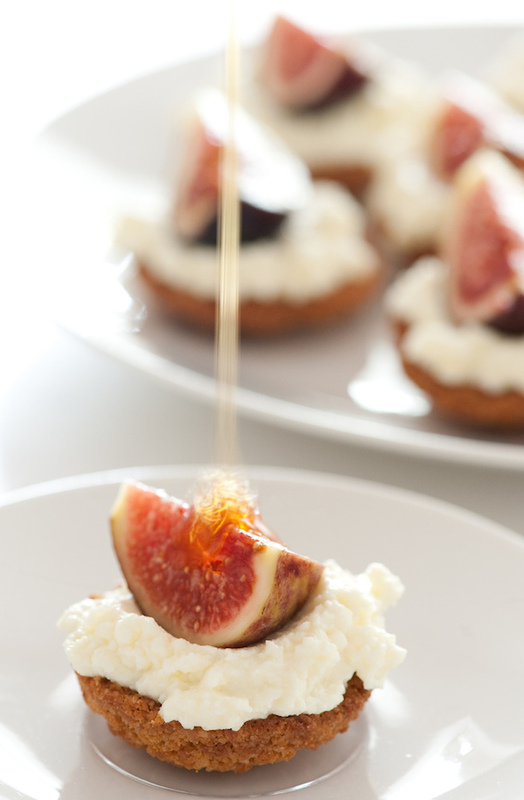 The lovely little ricotta tartlets with fig and honey above are from that cookbook. She also wrote a "5 ingredients 10 minutes" cookbook, which I think is pretty awesome. It's a paid ebook, but you can read 10 sample recipes for free right here. I also love the 5 ingredients sections of Cooking Light and Clean Eating. I tried a few of these recipes and truly enjoyed them- quick and easy to make, fresh and delicious to eat. I also tried a couple of recipes from 4 ingredients. They don't have much content available on their website, but all the recipes are 4 ingredients only. My favorite is the entertainer timbale from the fresh and healthy section. I don't eat meat so I replaced the meat with apple slices and cheese slices, and it was delicious. Easier to cook than to eat though! So there you have it, a few great resources for easy, quick and simple meals. I hope these are helpful to the not-so-good cooks among you- I can't be the only one! P.S. I'm not a fan of Food as I find it hard to navigate, but they also have a 5 ingredients or less recipes section. Looks delicious! 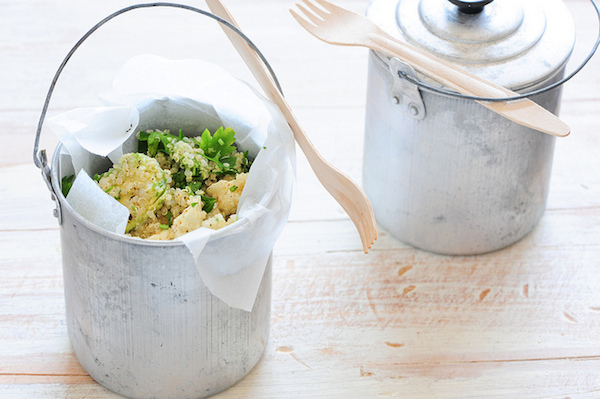 That quinoa salad looks great and the little bucket is so different and interesting. I am constantly so inspired by the creativity of people!